Dynamotion provides numerical analyses of dynamic systems using multibody codes. FastBike is an advanced multibody code for the dynamic analysis of motorcycles and scooters. Any simulation is as good as the input parameters are, so Dynamotion provides expert support to populate the model datasheet: we can experimentally characterise inertia, stiffness, tyre properties, or provide such data from our database. The “optimal manoeuvre” software allows us to measure effectively the vehicle’s manoeuvrability, i.e. 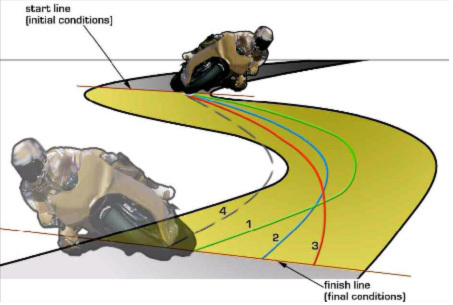 the ability of the motorcycle to complete complex manoeuvres in the shortest possible times. This is very important when designing a vehicle for a specific reason (for example, racing), when looking for the optimal value of a parameter (e.g. centre of mass position, gear ratios, etc.) or when comparing different vehicles. 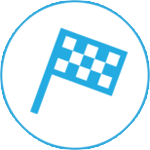 Dynamotion provides analyses using the “optimal manoeuvre” method, as long as it is provided with the track geometry and the vehicle characteristics (the parameters of which can be either provided or measured by Dynamotion). We provide simulation services with many other simulation softwares. Ask us for a simulation service.